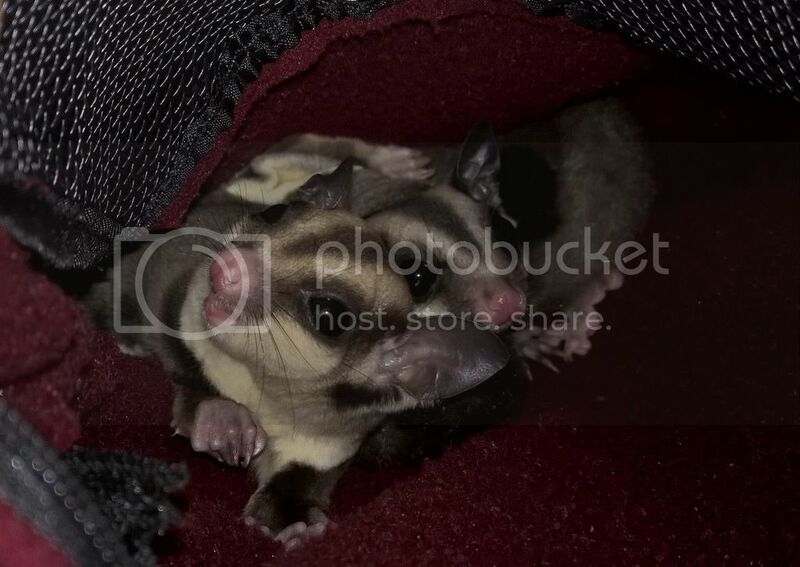 I adopted two gliders a few weeks ago. They are not drinking water. The previous owner said she never saw buddy drink water, but Lola has. The vet said they would die if they didn't drink water, but their water is still full after a week. I added apple cider vinagar to their water, as I do with my other 4. Should I try sugar water, or something Else? Seems they should drink something. I would change their water to just plain water, the same with your other gliders. If you want to add apple cider vinegar give them a second water bottle. You might also try giving them a small bowl/dish with some water as well as their bottle, to see if they like drinking from that any better. Mixing a tiny bit of honey with the water in the dish could help entice them, too. I also recommend offering plain water. I know that apple cider vinegar has lots of health benefits, but it's also has negative effects, see here . I also recommend using these in small size or these, both are very handy for serving water, nectar (if not too thick in silo, cup okay for thick nectar). The cup is also good for serving f/v, treats or pellets (if you offer those). Cups are covered to help protect from soiling, Silos have small bowl, not easily soiled, but they are easy to clean and never fail. So my four gliders have always had a drop of apple cider vinegar in their water. Do you think a drop is bad for their teeth? I give it to them for the Urinary benefits. Two gliders are 4 and two are 3. The new ones would not drink regular water. I will add a bit of nectar or honey to see if that works. Well maybe offer both then. I'm not sure of the effects of apple cider vinegar on gliders teeth. I was going to get some to add to my dog's food because she has itchy skin (allergies, been to vet). I've changed her food and give her benadryl at night, but read apple cider vinegar is good for their skin. Anyway, I later learned it also can harm the esophagus, so I haven't tried it yet. Keep in mind that gliders get most of their water from their foods. If you are using a good diet it will account for it. They will tend to drink very little water if their diet is good and balanced. Mine usually only drink water when I offer kibble and if they get up and it's warm in the room. But I offer it in a silo, not a water bottle. Unlike rabbits, rats and hamsters that eat mostly pellets.